Finding ancient bugs trapped in amber is hardly new, but this Cretaceous-era assassin fly may be the most pristine three-dimensional preservation of an insect we've ever seen. 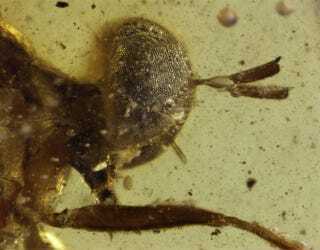 The amber fossil was discovered by Torsten Dikow from the National Museum of Natural History. It's a newly recorded species of assassin fly called Burmapogon brucksch, an insect that terrorized the Cretaceous some 100 million years ago. They're called assassin flies because of their fierce predation strategy; they ambush and catch their prey in flight, puncture their armour, and inject them with digestive fluids before extracting the nutrients.